Daintily iced buns, perfect for a girly coffee morning or tea party. 1 Preheat the oven to 190°C/Gas 5 and line 18 bun-tin holes with pretty paper cases. 2 Tip all the ingredients for the cake mix in a bowl (it is very important that the butter is at room temperature and thus softened). Using a hand-held electric whisk, mix well until the cake batter is smooth and creamy. 3 Divide the cake batter evenly between the bun cases. There is enough mixture to three-quarters fill each bun case, so don’t over fill or the mixture will go all over the oven. Bake in the oven for 12–15 minutes or until well risen, golden and cooked. Remove from the oven, transfer to a wire rack and leave to cool. 4 Meanwhile, make the butter icing. Beat the butter with a hand-held electric whisk or wooden spoon and gradually beat in the icing sugar. Beat in the grated orange zest and enough orange juice to taste and give a soft but not runny consistency. 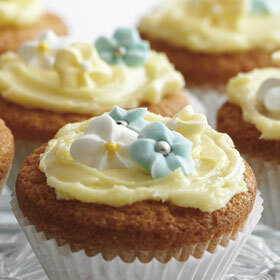 5 When the cakes are cold, spread the orange icing on top and decorate with sugar flowers. For a special event, pop the iced buns in a pretty tin and pipe a letter on each cake to spell Happy Birthday or Happy Christmas. 6 Check on the internet for some great mail order cake decorating suppliers who stock coloured paper cases and dainty iced flowers to decorate these cakes for a very special occasion. Recipe taken from Good Food, Fast – Dairy Cookbook. I will have to try it.